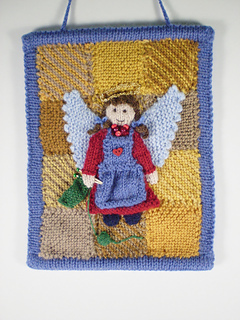 This is a pattern for a knitted picture featuring a Country Angel. 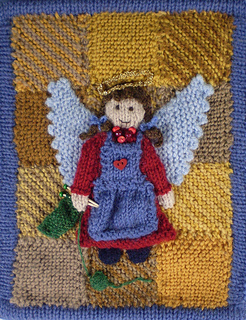 She wears a dress and apron along with her wings and is holding her knitting. The picture is put together like a quilt with the background being made up of garter stitch squares knitted out of oddments of DK weight yarn. The quilt is about 20 x 24 cm and is framed with a knitted border.